At Kredits, we do not believe in off-the-shelf, one-size-fits-all microfinance technology solutions. We understand that every MFI is unique. It is why we work on-site with every client to analyze their operation, and develop ways to improve their core processes - before we begin a customized implementation of our state-of-the-art MFI technology solution. 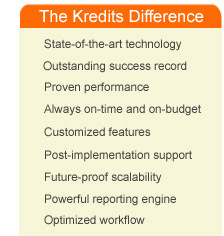 It's the Kredits difference and the reason that we enjoy an outstanding implementation record.